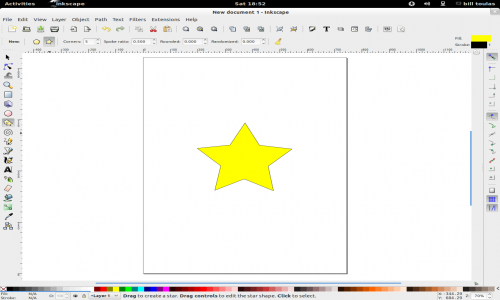 Inkscape is a magnificent open source vector graphics editor, with capabilities similar to Illustrator, CorelDraw, or Xara X, using the W3C standard Scalable Vector Graphics (SVG) file format. It is used for many purposes like designing icons, textures, cartoons, graphics, etc, but did you know that you can now print what you draw in Inkscape on 3D? Thanks to TinkerCAD you can! First thing you need to do is draw something on Inkscape. I am not an artist, so I will just draw a star here. 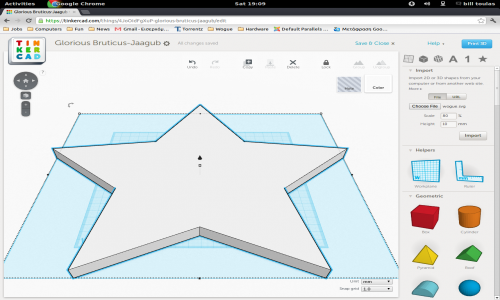 Inkscape also offers the ability to draw 3D boxes with manipulative dimensions, but I suggest you use 2D drawings as something goes wrong with the 3D import to TinkerCAD (at the time of this writing). After you finish your drawing, save the file as .SVG, otherwise you won’t be able to import. 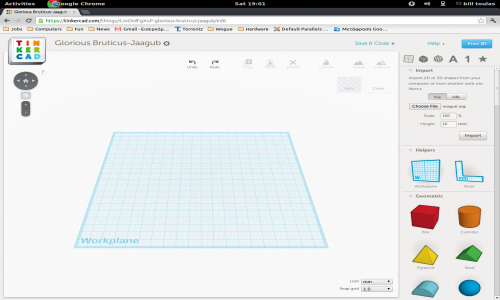 Now you can visit tinkercad.com. Be sure to use a browser that supports WebGL. You can create a new account, for free, in just a few seconds. This will grant you access to the drawing tools and the very helpful and friendly game-like tutorials. I will assume that you took the tutorials to get the idea of how the editor works and proceed to importing the file from Inkscape. You open the editor to create a new drawing. On the top right you can see the option to import. Press this button. Then select your drawing .SVG file from your hard disk and press the import button. Remember to adjust the scale percentage before importing if the imported object is too big (it probably will be). You can then adjust the height and the thickness of the object, add more objects, combine them, resize them, mix the shapes, and meet the desired result. 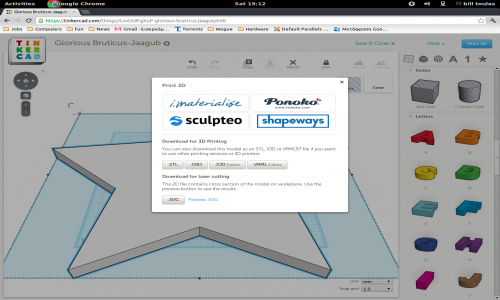 After all that, you can save your project on-line, print it using one of the services you can see in the following screenshot, or just download it in .stl, .obj, x3d, or vrml format. Of course, this is not the most advanced and sophisticated way to draw 3D objects, but it certainly is a great way to do simple things in a very easy and friendly way!